The DJI Spreading Wings S900 has been designed for professional aerial photographers and cinematographers. The lightweight, compact design of the DJI Spreading Wings S900 makes it very easy to transport anywhere. 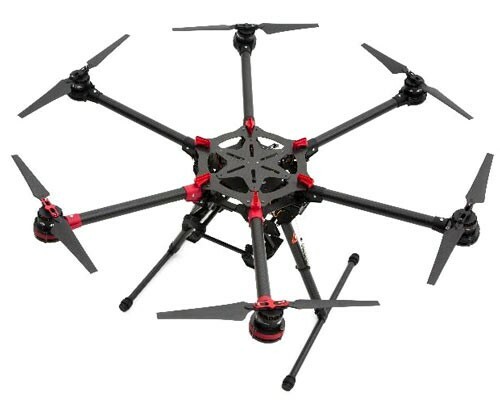 The DJI S900 is equipped with the most advanced motors and electronic speed controllers, the frame is constructed from carbon fiber. The S900 has a brand new power distribution system which gives the power, strength and stability needed to create amazing footage. The use of carbon fiber in the frame, landing legs and arms sees the S900 weight at 3.3 Kg’s with a maximum take-off weight of 8.2 Kg’. The DJI S900 system has been tested at 6.8 Kg take-off weight and achieved a hover time of 18 minutes when used with a 12000 mAh battery hovering at 2 meters on a calm day. 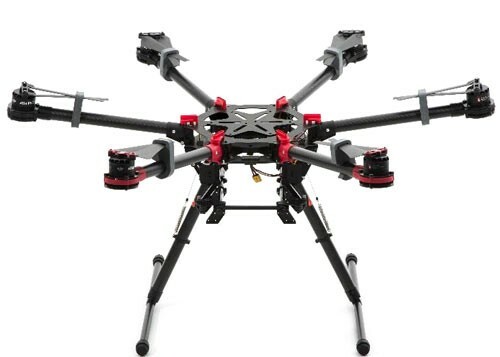 The Retractable landing gear and the low gimbal mounting bracket gives an extremely wide range of possible shooting angles and camera movement. As seen on the DJI S1000 Octocopter Premium the S900 Zenmuse gimbal mount bracket is separated from the main frame by speicially designed damper system. This significantly reduces the high-frequency vibrations transmitted to the gimbal which makes your shots clearer and sharper. 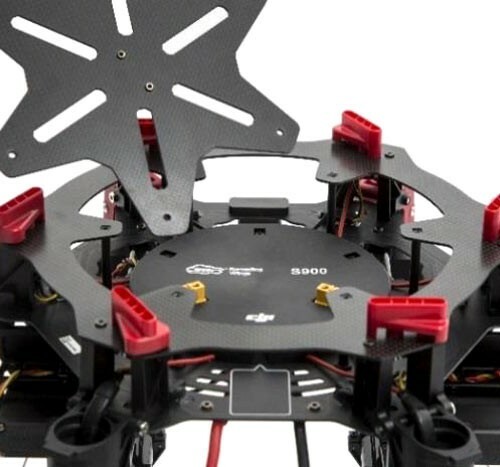 The upper central board can be easily removed, allowing for easy access to install your flight controller, IMU and other systems like the iOSD Mark II and the DJI Lightbridge. The DJI Spreading Wings S900 system is fully compatible with the DJI Wookong M and DJI A2 Fight controllers. The DJI Spreading Wings has an innovative arm design, each arm is designed with an 8 degree inversion with a 3 degree inclination; this makes the S900 more stable when rolling and pitching, yet more flexible when rotating. The 40 Amp electronic speed controllers (ESC), deliver the fastest response times available, each arm has the ESC built in to each arm. The combination of the ESC’s with its 4114 pro motors and 1552 folding propellers deliver 2.5 kg’s of thrust with the high performance 1552 folding propellers. The V-type mixer design used with the S900 has a maximum thrust of 15.0 Kg’s. The latest design of arm, motor and ESC adopts the single wire stator design, offering improved heat dissipation, better performance which gives a very reliable system. The use of the AS150 spark-proof plug prevents short circuits and an easily way plug in your power supply. The A2 M Flight controller is the flagship muti-rotor controller from DJI Innovations. The DJI A2 uses DJI’s flight controller experience and heritage seen in the other ranges of high-end flight controllers from DJI. The A2 flight controller continues to deliver the latest innovations with the highest specifications for demanding users and demanding flight conditions, however it also innovates beyond the competition in key areas, which DJI hopes will continue to give it the edge over other flight controllers. The DJI A2 offers a more precise position hold in more extreme environments with the latest generation IMU and an upgraded GPS module, the new GPS module will help maintain a more accurate position and altitude lock even in a semi congested environment, over and above that experienced previously with the Wookong M. The higher accuracy of the GPS is complemented with the enhanced anti-vibration characteristics in the A2 flight controller’s IMU. These improvements come together to deliver the most accurate position hold seen to date from DJI. A built in 2.4ghz DESST receiver in the DJI A2 greatly simplifies the system installation and improves the link security of the remote control system, the DJI A2 flight controller is compatible to the following receivers, Futaba FASST series (Futaba S-Bus receiver with S-BUS interface), JR/SPEKTRUM receiver with two-way DSM2 satellite interface and the traditional receivers with the DJI DBUS Adapter module. The flexible and extended capability of the A2 for the pilot comes in the form of twelve output channels, this means that the A2 allows users to greatly extend the uses of this system, with remote parameter adjustment enabled the DJI A2 provides an interface with the assistant software for iOS devices via Blue tooth (Blue tooth 4.0). The parameters can be adjusted at any time on a mobile device, using only an LED indicator with a built-in Bluetooth module, which makes it easier and convenient than needing a laptop to make these adjustments. The upgraded power management unit (PMU) for the A2 is to allow for greater power consumption needed to operate. The DJI A2 has two power outputs, one for the A2 system and the receiver separately, this allows the PMU to carry out battery voltage monitoring, and provides two CAN Bus interfaces. The dual CAN-Bus system of the A2 system has a dual CAN-Bus design, which means that the system data throughput will be doubled and future expansions and additional auxiliary can be added with ease. Some of the most advanced features on the DJI A2 are the, Motor test, Power lock when connect assistant software, Inverted Nose-In Return-to-Home, home point/instruction and Compass error alarming.